Sound quality and reliability are very important. Music Man Productions utilizes professional sound equipment to ensure the highest quality sound for your event. In addition to our primary equipment, we also bring backup equipment so that if a technical difficulty takes a piece of equipment out of commission, the party can continue uninterrupted! Whether it's the voice of your maid of honor giving a toast, or the musical selection from your first dance, your guest need to HEAR it. That's where the sound system comes in. Music Man Production utilizes professional DJ sound equipment designed to deliver the high-quality sound you want at the volume you need. At Music Man Productions, we don't ascribe to the DJ philosophy that more gear equals a better performance. Especially for wedding receptions-our specialty-the quality and tone of the sound is generally much more important to you and your guests than brute volume. For most of your reception, your guests want to be able to communicate with each other without yelling, so a lower volume is more appropriate. However, when the night builds to a climax and the dance floor is packed, Music Man's sound system can deliver all the volume you'll need. Remember...it's not just the quantity and size of the speakers...it's what you do with them. Over the years, Music Man Productions has performed in a wide variety of venues...from tiny Legion halls to large event centers. So our sound system is designed to provide quality sound in whatever place we play. It all starts with the music source. Music Man Productions uses high-quality MP3 files delivered via a dedicated laptop computer. The digital age has created a number of benefits for our clients, including superior sound quality. An even greater benefit is the ability for Music Man Productions to fill even the most obscure musical request by purchasing the music over the Internet. We use Amazon and iTunes for most of our music purchases. And even if your venue does not have a WiFi connection that we can use to deliver that special request, we can still deliver by using our smart phones to download and play back tunes. 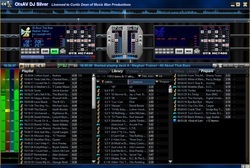 You can't stump the DJ when you choose Music Man Productions! In addition to our primary music laptop, Music Man Productions' hosts always have a backup music source to keep the party rolling even if disaster strikes! During your event, you may want to be able to speak to your guests without having to come to the DJ's table to do so. This is especially important for weddings, where welcome speeches, blessings, and toasts are a tradition. Music Man Productions provides a high-quality wireless microphone for your use as needed during the event. 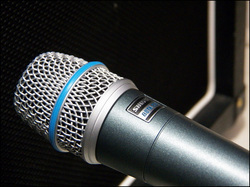 The wireless microphone has the range necessary to reach any corner of the venue to ensure the best flexibility. Like with sound systems, bigger isn't always better when it comes to lighting. Music Man Productions provides a modest but effective light show at no additional charge for all of our events. We also offer an optional upgrade to include uplighting as part of your event to add some extra "pop" to the light show.